My last full day in Scotland I spent in the Borders region, visiting three abbeys mixed with gardens and views. 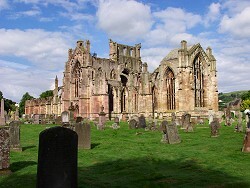 The first abbey was Melrose Abbey, just a few minutes walk from the hotel. It was founded in 1136 by King David I, but repeatedly attacked by the English (in particular in 1385 and 1545). 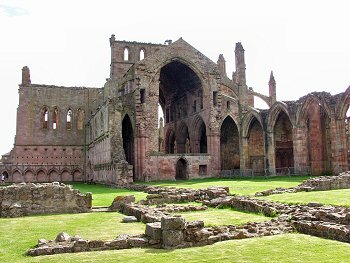 After the reformation the abbey fell into disrepair and only ruins remain today. 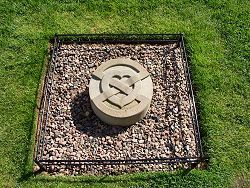 During excavations in 1997 support for the legend that Robert the Bruce's heart is buried at Melrose Abbey was found: A heart cask was unearthed an later reburied at the place marked with the stone on the right. Next to the abbey is Priorwood Garden serving two functions: First there is a garden where flowers used for drying are grown. They are then made into dried flower arrangement which can be purchased in the garden. Next to the flowers is a beautiful Apple Orchard with historic apple trees. 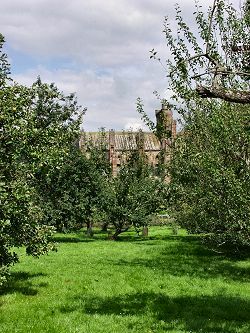 I rested on the benches in the orchard for a while, very relaxing. 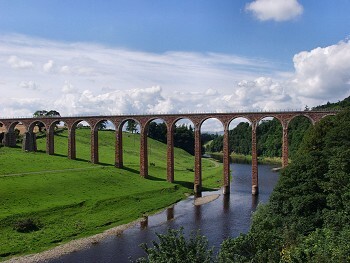 Making my way out of Melrose to Scott's View I stopped at Leaderfoot Viaduct crossing the River Tweed. 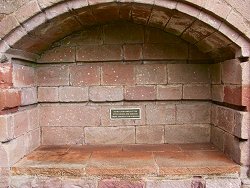 It is now disused, but was once used by a railway line between Carlisle and Edinburgh. I doubt it is possible to walk on it, the best views are from the parallel road bridge anyway. On my way to Dryburgh Abbey I stopped at Scott's View, the favourite view of Sir Walter Scott. It is a very nice view over typical Borders country, also a nice place to have a picknick. 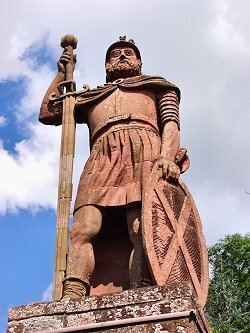 I also quickly stopped at the first ever statue of Sir William Wallace, erected in 1814. 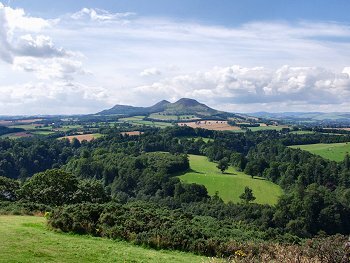 It's a short walk from the main road, overlooking Borders country in a similar direction as Scott's view. 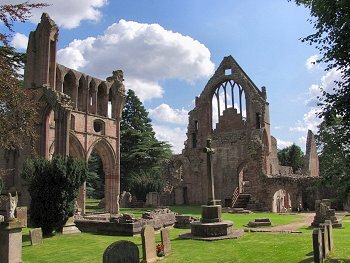 Dryburgh Abbey is set in a very nice area with a lot of nice trees surrounding it. 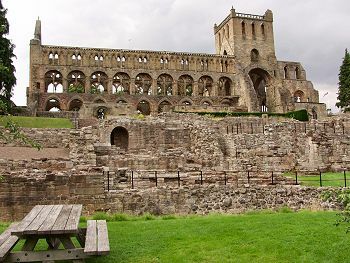 The ruins are far less substantial than at Melrose and Jedburgh. I found this bookshelf quite interesting though, complete with grooves for the shelves. Sir Walter Scott is buried here, but the grave is nothing special. 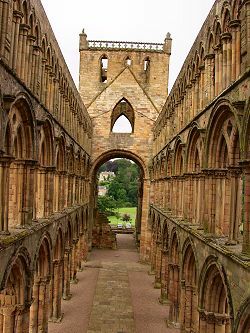 The last abbey I visited was Jedburgh Abbey. Not much is left of the conventual buildings, but the remains of the Abbey Church are impressive. Especially the view from the small balcony in the west front is impressive. After three abbeys and a few other places in a day I was tired and returned to Melrose. The last dinner of my World Tour of Scotland I had at the very nice Hoebridge Inn (Tel 01896-823082) in Gattonside, just accross the suspension bridge over the River Tweed. I had a very nice Angus beef fillet with some red wine, followed by a wee dram (Laphroaig, as you ask). An excellent finish to a fantastic holiday.